I felt like sticking with our theme of SNL from yesterday, and wanted to show some vintage shots from this iconic program. The show started in 1975, and in 2016, that makes it 41 years old. That just doesn't seem to be possible in my book! Look how young Bill Murray is in that photo? I just love him, he is so funny but can do drama pretty well. My favorite is probably Caddyshack, even though I am not a fan of golf in any way, it is one of my favorite comedies! Steve Martin has hosted a zillion times, and is another great comedy legend. Eddie Murphy as Mr Robinson's Neighborhood is just so classic. Gilda Radner was perfect as Roseanne Roseannadanna with that very classy hairstyle! Gumby and Mr. Bill were such icons in their day. Mr. Bill even had a commercial! 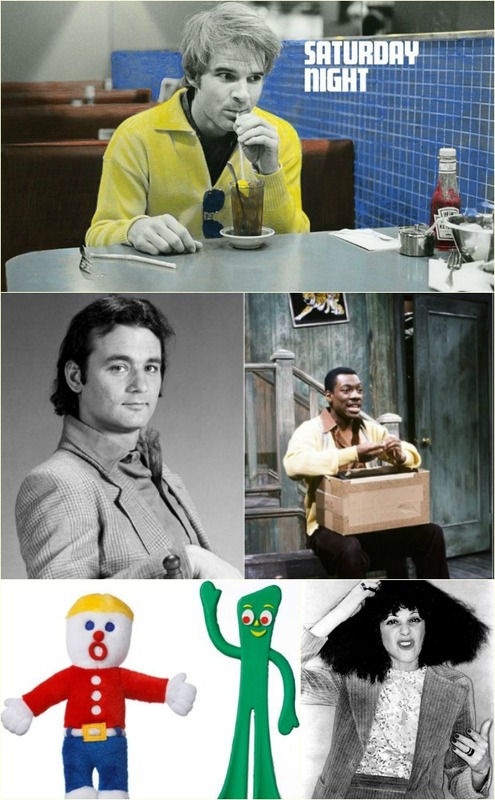 So, who is your favorite SNL comedy legend? I find it hard to pick just one, there are just too many great folks to choose from!